The Sin City tradition kicked off in 1946 with lots of cold cuts. It is nearly 2 a.m. on a Saturday night in Las Vegas. No surprise that the casino at Palace Station—an old-school joint dating back to 1976, recently renovated and situated a turn or two off of the neon-saturated Strip—is still crowded with gamblers. 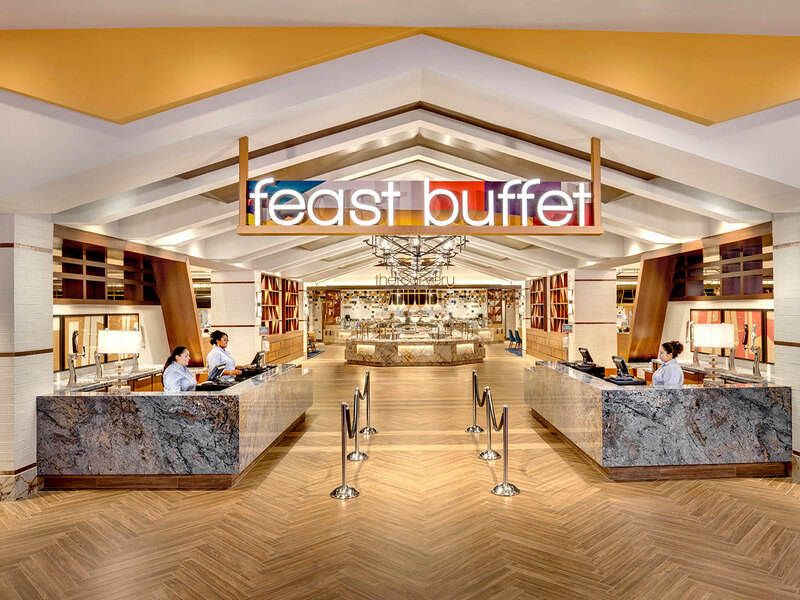 More unexpected, though, is that an abbreviated version of Palace Station’s highly-touted buffet, known as The Feast, is rocking pretty hard. A bargain at $10.99 for an after-hours, all-you-can-eat sprawl that includes bacon and eggs, biscuits and gravy, and Southern fried chicken, it attracts hungry gamblers and stands out as the only all-night buffet in Vegas. Patrons may not realize it, but their loaded plates pay tribute to the groaning boards and cold-cut spreads that, at around midnight on an evening in 1946, kicked off a venerable casino-dining tradition. Back then, Sin City was more like Transgression Town, with maybe a dozen or so low-rise casinos of note and nary a celebrity chef in the house. However, Beldon Katleman, a casino financier who owned the El Rancho—the first casino to plant itself on what is now the Vegas Strip—realized that food was a natural accelerant to gambling, and he recognized that midnight snacks kept guests in action. Katleman and his customers referred to his late-night culinary enterprise as a “chuck wagon,” though it was officially named the Buckaroo Buffet and stood out as a novel concept in Las Vegas. While the cold cuts and handful of hot dishes seemed generous, the Western-themed offerings were rooted in practicality and profit. “They did it to keep people in the casino after the shows,” says Anthony Curtis, publisher of the Las Vegas Advisor, which tips off readers on the best of Vegas and recently deemed The Feast to be the top one in the city. As for the Buckaroo, he adds, “It was a low-end spread but a really good spread”—and wildly successful as a sleep deterrent. Noticing the instant allure of the Chuck Wagon—it soon evolved to the point where chefs in toques stood behind slabs of ham and proffered deviled eggs—other casinos followed suit. Those offerings, like the gambling joints themselves, grew increasingly elaborate. The Desert Inn adorned buffet tables with ice sculptures. The Silver Slipper offered “50 Epicurean delights, served 24 hours every day.” Chalk it up to prevailing tastes of the times, but the casino’s 98-cent dinner spread appeared heavy on mayonnaise-riddled salads alongside Jell-O laced desserts. That said, if Vegas stood a long way from becoming a dining destination, the always swanky Dunes aimed to step things up by offering its so-called “Hunt Breakfast.” Served only on weekends, from 10 a.m. until 2 p.m. for a relatively dear $1.50, it was what Curtis characterizes as “a forerunner to the Champagne brunch.” If bubbly was not quite on offer, a promotional postcard shows that breakfasters gorged on bagels and lox, scrambled ranch eggs, lamb chops, kidney and mushrooms sauté, and sherry braised Swiss steaks. 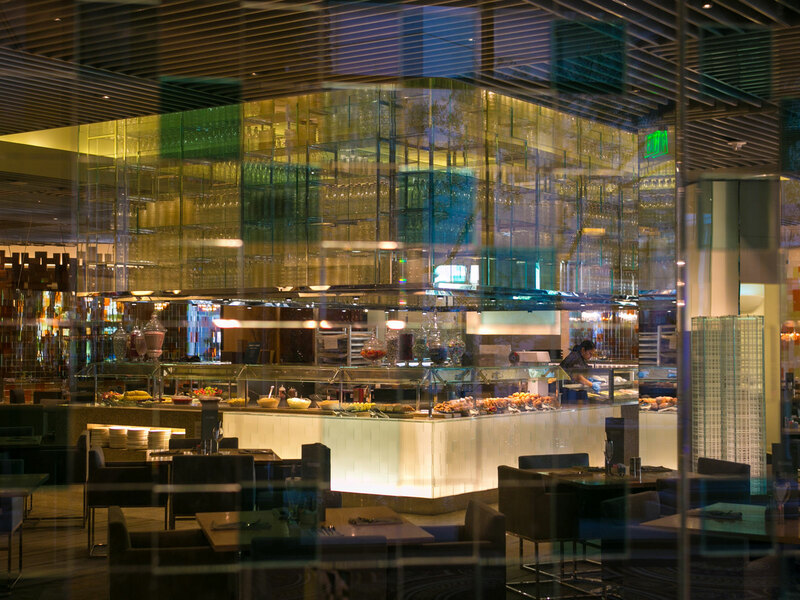 Over time, the Vegas buffet became as ubiquitous as roulette. Steam tables kept food hot and management maintained prices so low that diners turned all-you-can-eat offerings into loss leaders (at least for a while). But everyone was happy with the arrangement: gamblers stayed in-house, and they got to eat for rock-bottom prices. Nobody cared that the food was lackluster. The deals were too good. During that same era, making a bid for quality, the otherwise bland Bally’s Las Vegas launched its high-gloss Sterling Brunch buffet. Available on Sundays only, with a then-hefty $29.99 price tag (current tab: $105), it quickly established itself as the most elite buffet in town—and, to this day, Sterling rules the morning-meal roost. When the Rio All-Suite Hotel and Casino opened in 1990, it was situated off-Strip, which put the South-America-themed spot at a bit of a disadvantage. In a bid, perhaps, to make up for the less than ideal location, its bosses raised the stakes by offering the most expansive buffet in Vegas. Known as Carnival World, it featured (and still does) more than 300 different dishes. “Carnival eclipsed everything else at the time,” marvels Curtis. “We called it a mini food city. There were separate islands for salads, Italian, Mexican, Chinese, seafood.” The place even had Mongolian barbecue, which seemed exotic at the time. High-end all-you-can-eat feeds made their bones with sushi, eggs Benedict for brunch, oysters on the half shell, succulent prime rib, and good king crab. While some Vegas buffets are notorious for serving dry versions of the luxe crustacean, Curtis remembers driving toward Hoover Dam where a casino near there offered him and fellow advantage eaters “fabulous king crab that we would just pound.” Bottomless pours of beer and wine top it all off. The Mirage even initiated a take-out option where you pay for a to-go box and load it up with all the food that will fit. Lavish as buffets had become, though, it was difficult not to feel some concern about the origins of your meatloaf or spaghetti carbonara or turkey with all the fixin’s. After all, diners did not see the food being prepared and inevitably wondered how the high quantity meals were actually made. If the endless steam-trays of food left you contemplating industrial-style cooking facilities, complete with giant vats of mashed potatoes and meat grinders that wouldn’t be out of place in a factory, well, some of the romance was removed from the whole affair. In the 1990s Palace Station Casino (yes, the place with Vegas’s only late-night buffet of the moment) did away with those concerns by creating what Curtis characterizes as “the modern buffet.” As he puts it, “They called it an ‘action buffet.’ The kitchen was in the open and you saw them cooking for you.” You could even order food that would be custom prepared. 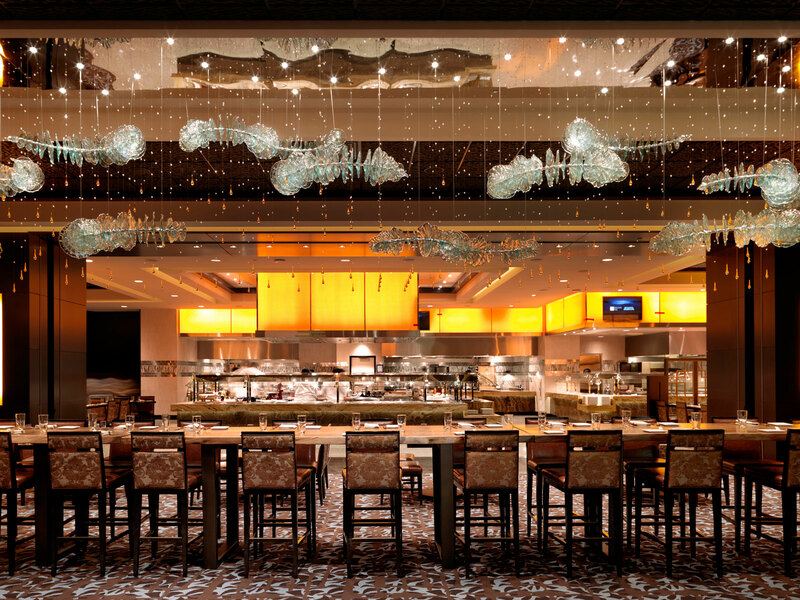 Today, buffets embodied by Wicked Spoon in the Cosmopolitan of Las Vegas, Bacchanal at Caesars Palace, A.Y.C.E in The Palms, and Palace Station’s just-upgraded Feast are divided up by cooking method, rather than type of food. Hence, stations include designations for roasting, frying, and wok cooking. Somehow, the set-up makes for a more satisfying experience.